From a recent study conducted in Nicaragua, Ethiopia and India, scientists propose to apply the concepts of citizen science to involve farmers in research processes, to help them adapt their crops to the negative effects of climate change. The study results were published in an article titled “Crop variety management for climate adaptation supported by citizen science” in PNAS Journal (Proceedings of the National Academy of Sciences of the USA), which explains that to cope with the adverse effects of climate change, farmers need to replace their seed varieties with new ones. However, every time they decide to use new varieties, they risk choosing one that does not fit properly to their farm’s weather conditions. These problems, led by climate change, generates an increasing need for available information that could help reduce the risk producers are facing and choose the most appropriate variety for their agro-climatic conditions. Jacob Van Etten, the study’s coordinator, said that this project came from the idea that in agricultural studies, citizen science methodologies, increasingly used by ecologists and environmental scientists, could be applied to obtain a large amount of information collected by ordinary citizens. For example, bird ecologists collect a large amount of information through bird watchers, who contribute to the creation of a large database with their inventories, that allows tracking the movements of birds on a continental scale throughout the years. This way scientists know how climate change is affecting the migration patterns. "This is why, we came up with an equivalent citizen science approach to collect information that helps farmers in their adaptation to climate change process" said the coordinator. To verify that the data collection carried out by farmers, is scientifically valid information, the authors linked the data generated by the farmers in 12 409 plots during different sowing seasons with the rainfall and temperature data of each farm. To do this, "we tested a new method of statistical modelling to detect relations between climate and the variety’s performance and try to explain why certain farms perform better than others," ​​said Kauê de Sousa, one of the authors of the study. "The results were surprising for the three countries; the applied models show that a single climatic variable can explain the varieties’ behavior. The results clearly corresponded to what we know about the physiology of the used varieties in these crops. We were also able to give recommendations for certain varieties for different agro-climatic zones," de Sousa added. "Our study shows the need to improve the recommendations of heat-tolerant bean varieties in Central America," said EfD senior researcher Leida Mercado, one of the authors of the study. Mercado explained that farmers in Nicaragua collaborated with more than 800 tests with red bean varieties. "Each farmer experimented with a group of three new varieties that were randomly assigned and evaluated their performance by comparing them with each other, as well as with the local variety that they usually sow on their farm. We found that, under conditions of extreme heat, new varieties outperformed local varieties, generally recommended for the area”, Mercado said. 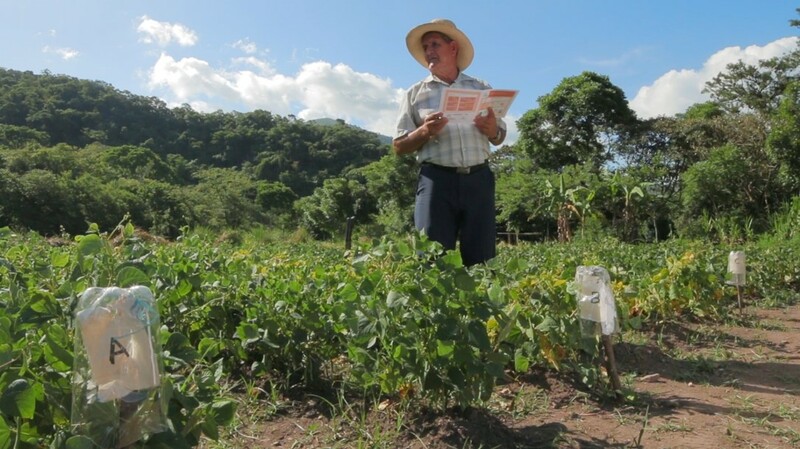 The author added that these results will serve as a basis to generate recommendations to improve adaptation and reducing the risk of farmers facing the adverse effects of climate change in Central America. The authors stated that the information generated by farmers improves the recommendations provided by the scientists. In addition, in the future, the information could be combined with climate forecasts to make the recommendations even more precise. "This study not only confirmed that our initial idea was correct, and that citizen science can help farmers adapt to climate variations, it also showed the enormous potential of citizen science in agriculture, which is a field to discover, "concluded van Etten. This research was developed within the Mesoamerican Agro-Environmental Program (MAP-Norway) implemented by CATIE (Tropical Agricultural Research and Higher Education Center) between 2013 and 2017. The article is available at PNAS website.